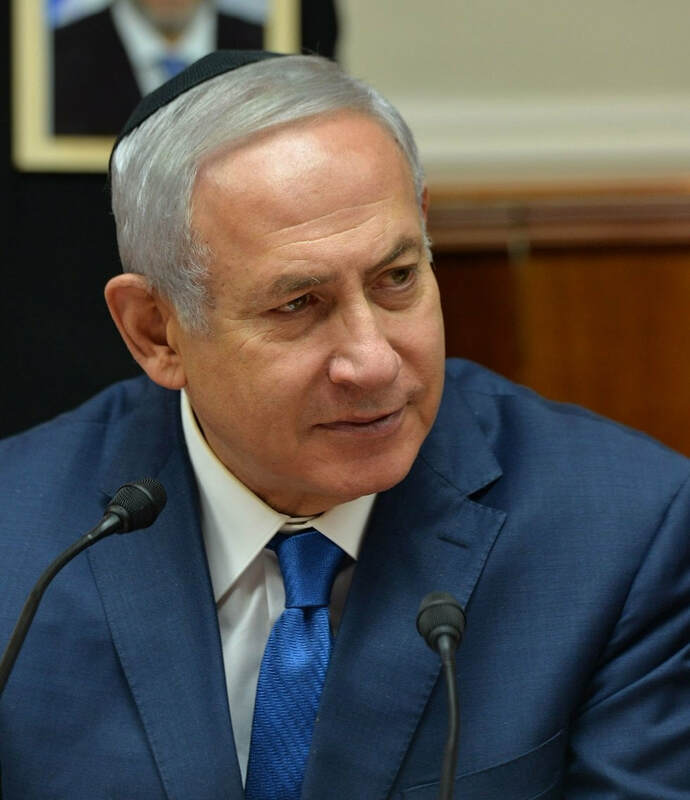 Speaking in a Likud faction meeting, PM Netanyahu says only technological strength can lead to agreements with the Arab world, since 'concessions are perceived as weakness'; hails US President Trump's decision to reimpose sanctions on Iran. 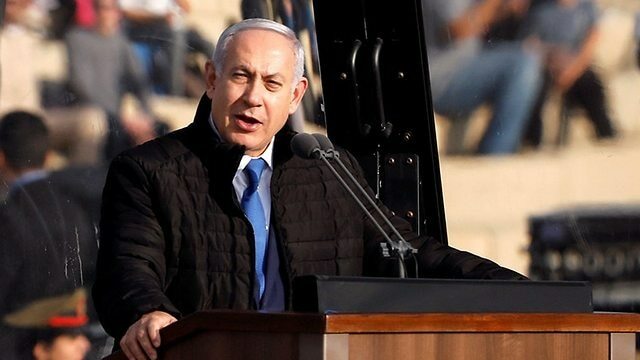 Speaking at a Likud party meeting, Prime Minister Benjamin Netanyahu said Monday that the demonstration of strength is the most important thing in Israel's foreign policy. "'Occupation' is bull. There are countries that have conquered and replaced entire populations and the world keeps silent. Strength is the key, it makes all the difference in our policy towards the Arab world." Netanyahu stressed that concessions are perceived as weakness in the Middle East . "As opposed to the perception that concessions promote agreements with the Arabs, they would only bring minor and short-term changes—nothing more. "The right thing to do is to make progress through common interests, which are based on technological strength," the premier explained. In addition, Netanyahu addressed the resumption of US sanctions against Iran that came into effect on Monday. "This day is an historic day. Today is the day Washington imposed the toughest sanctions Iran has ever known, in an attempt to halt its aggression," Netanyahu stressed. "I would like to again thank US President Donald Trump for the courageous, determined and important decision. I think it contributes to stability, security and peace in the region. "We can already witness the influence of these sanctions—Iran is already reducing its budgets, funding aggression elements in and outside its territory," he concluded. The UN nuclear watchdog has said its independence is paramount and it does not take intelligence presented to it at face value, in an apparent response to Israeli Prime Minister Benjamin Netanyahu's description of a "secret atomic warehouse" in Iran. "The agency sends inspectors to sites and locations only when needed. The agency uses all safeguards relevant to information available to it but it does not take any information at face value," International Atomic Energy Agency chief Yukiya Amano said in a statement on Tuesday. Amano's statement made no specific reference to Israel or the statement but it is his first public pronouncement since Netanyahu's speech at the United Nations General Assembly last week. "All information obtained, including from third parties, is subject to rigorous review and assessed together with other available information to arrive at an independent assessment based on the agency's own expertise," Amano said. "In order to maintain credibility, the agency's independence in relation to the implementation of verification activities is of paramount importance," he added. “What I’m about to say has not been shown publicly before ... Today I’m revealing the site of a second facility, Iran’s secret atomic warehouse,” he said. The new site Netanyahu identified sits a short distance from Shourabad, where the Mossad pinched a trove of documents and evidence showing that Iran had archived its nuclear materials despite the nuclear deal. “When I spoke here 3 years ago Israel stood alone among the nations. Of the nearly 200 countries that sit in this hall, only Israel openly opposed the nuclear deal with Iran. We oppose it because it threatens our future, even our very survival,” the prime minister said. 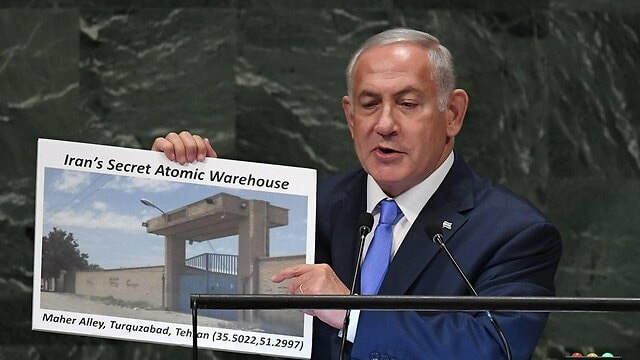 Continuing what has become a traditional characteristic of presenting visuals during his UN speeches, Netanyahu said “Let me show you exactly what the secret atomic warehouse looks like. Here it is,” while holding up a picture of satellite and up-close images. According to Netanyahu, the second secret site was right near a rug-cleaning store, which he quipped may now be radioactive. The prime minister also claimed the site contained some 15kg (33 pounds) of radioactive material that has now been moved as part of Iranian attempts to hide evidence of its nuclear weapons program. Iran dismissed Netanyahu's claims as laughable. “The world will only laugh loudly at this type of false, meaningless and unnecessary speech and false shows,” said Iranian foreign ministry spokesman Bahram Qassemi said, according to Fars News. Qassemi said Netanyahu's accusation was "not worth talking about." "These farcical claims and the show by the prime minister of the occupying regime (Israel) were not unexpected," he added. Iran’s Foreign Minister Mohammad Javad Zarif said that there should be more scrutiny on Israel’s nuclear program and derided the visuals presented by the prime minister. “No arts & craft show will ever obfuscate that Israel is only regime in our region with a ‘secret’ and ‘undeclared’ nuclear weapons program—including an ‘actual atomic arsenal,’” Zarif wrote on Twitter. “Time for Israel to fess up and open its illegal nuclear weapons program to international inspectors,” he added. At IAEA conference, Israel’s atomic agency head Ze'ev Snir says 'Iran's threats prompt Israel to act in order to protect its nuclear sites;' Iran UN Amb. Gholamali Khoshrou says Israel's nuclear program must be supervised. Head of the Israel Atomic Energy Commission (IAEC), Ze'ev Snir, said Israel cannot ignore Iran and its proxies' repeated threats to attack its nuclear sites at the 62nd conference of the International Atomic Energy Agency (IAEA) in Vienna Tuesday. "Those threats prompt Israel to act in order to protect its nuclear sites," Snir stated. "The continuing turmoil in the region, threatens peace and security worldwide, and demands global attention. "The IAEA must conduct a robust verification of Iran's clandestine activities. The covert Iranian nuclear weapons program is a documented fact," he went on to say. 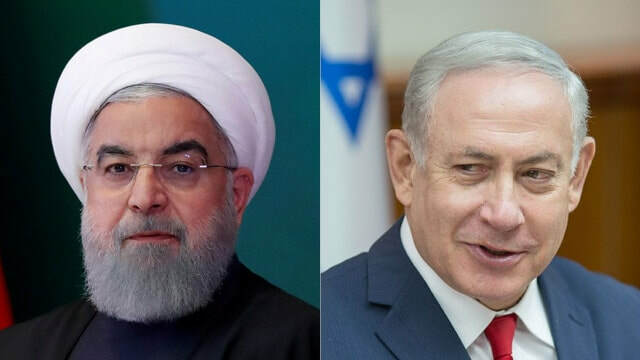 "The new information recently revealed by Israel, conclusively proves, that Iranian activities, were part of a well-orchestrated plan, to continue the development of nuclear weapons. "In light of these destabilizing elements, we cannot ignore the repeated and explicit threats, made by Iran and its proxies, to attack Israel's nuclear sites," the IAEC head explained. Security Cabinet member and Knesset member Minister Yisrael Katz said in an interview with Ynet Israel is constantly threatened by Iran. "(Iran's) regime is attempting to carry out a revolution, to threaten Israel, to threaten Saudi Arabia, and everyone in the region who is not Shi'ite," he said. "Obviously, (we are the ones mainly threatened—ed) since we are the powerful country that keeps Iran at bay. We know we have to protect our strategic locations," Katz elaborated. "We should pose a threat to Iran and cerate a deterrence against it," he added. It is the first time Israel has acknowledged it is reinforcing security around its nuclear reactor in Dimona. Until now, the IAEA viewed the protection of the nuclear reactor in Dimona as a precaution against pollution rather than protection against military and terror threats. Meanwhile, Iran has asked the United Nations to condemn Israeli threats against Tehran and to bring Israel's nuclear program under its supervision, state media reported on Thursday. Prime Minister Benjamin Netanyahu used a visit to a secretive Israeli atomic reactor in late August to warn the country's enemies that it has the means to destroy them, in what appeared to be a veiled reference to its assumed nuclear arsenal. "The United Nations' members should not turn a blind eye to these threats and must take firms actions to eliminate all Israeli nuclear weapons," Fars news agency quoted Iran's ambassador to the United Nations Gholamali Khoshrou as saying in letters to the UN secretary general and the Security Council. Khoshrou asked the United Nations to force Israel to join the Nuclear Non-Proliferation Treaty (NPT) and bring its nuclear program under supervision of the IAEA, a UN atomic watchdog. Israel, which is outside the NPT, neither confirms nor denies having the bomb, a decades-old ambiguity policy that it says keeps hostile neighbours in check while avoiding the kind of public provocations that can spark regional arms races. Israel is trying to lobby world powers to follow the United States in exiting their 2015 deal with Iran that capped the Islamic Republic's nuclear capabilities in return for lifting of sanctions. The Israelis deem the agreement insufficient for denying their arch-foe the means to eventually get the bomb—something that Tehran, which is a signatory to the 1970 NPT, denies wanting. Since its 1979 Islamic Revolution, Iran has preached Israel's destruction. It backs the Lebanese terror group Hezbollah and the Palestinian terror group Hamas. Its reinforcement of Damascus during Syria's civil war is seen by the Netanyahu government as a further Iranian deployment on Israel's borders. In Late April, Netanyahu revealed what he said was “conclusive proof” of a secret project underway in Iran for the development of a nuclear weapon—evidence that he said proved that Tehran had lied “big time” to the international community. The evidence, Netanyahu posited, prove “Iran has been hiding for years from the international community” its nuclear weapons development program. In August 2017, Hezbollah leader Hassan Nasrallah marked 11 years to the Second Lebanon War with a speech in which he threatened that "the defeat Israel suffered in 2006, it will suffer again, but it will be a much greater defeat." Nasrallah argued that Israel recognized Hezbollah's strength, "an example of that is the evacuation of the ammonia tank in Haifa. We hope they examine moving the nuclear reactor in Dimona as well, as it is more dangerous and needs to be taken care of." During operation Protective Edge, Israel intercepted three rockets that were launched at Dimona. Iranian Foreign Minister Mohammad Javad Zarif says Twitter has blocked the accounts of "real Iranians" but overlooks the "regime change" propaganda spewing out of Washington. Zarif made the remarks in a post on his official Twitter page on Sunday addressing Jack Patrick Dorsey, the co-founder and CEO of Twitter. He said the accounts of real Iranians, including TV presenters and students, have been shuttered for allegedly being part of an "influence operation." "How about looking at actual bots in Tirana used to prop up 'regime change' propaganda spewed out of DC?" 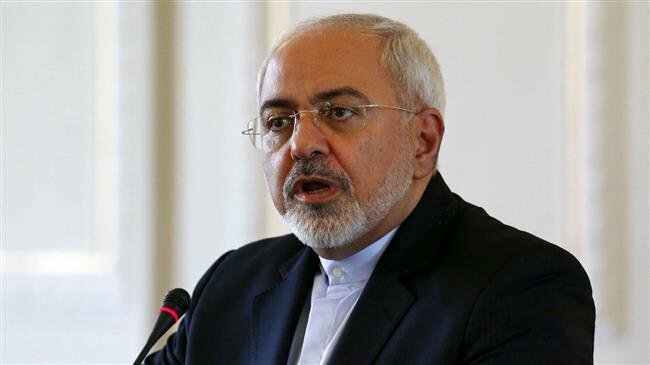 the top Iranian diplomat asked, alluding to the anti-Iran terrorist Mujahedin-e Khalq Organization (MKO), whose members are currently based in Albanian capital city. Iran's ambassador to UK, Hamid Baeidinejad, also took to Twitter noting that according to news outlets, there are 1,500 members of the MKO in Camp Ashraf in Albania, who produce millions of fake messages over online social media all of which seek regime change in Iran. Back in August, Google removed 39 YouTube channels linked to the Iranian state broadcaster. Google terminated those accounts, along with six blogs on its Blogger service and 13 Google+ accounts linked with Iran. The move came after Twitter and Facebook also blocked hundreds of accounts on suspicion of possible ties with Iran. The MKO has a dark history of assassinations and bombings against the Iranian government and nation. It notoriously sided with former Iraqi dictator, Saddam Hussein, in his eight-year war against Iran in the 1980s. The group has been behind most of the terrorist attacks, which have claimed the lives of nearly 17,000 Iranians since the victory of the Islamic Revolution in Iran in 1979. Initially designated as a terrorist organization by Europe and the US, the group has established close links with Western political parties. In recent years, several media reports have emerged about top political figures in the US and Europe receiving money from the MKO to speak favorably of the terrorist group. In September 2016, the last remaining members of the terrorist group were relocated from Camp Liberty (Hurriya), a former US military base near the Iraqi capital Baghdad, to Albania. Iraq had long urged MKO remnants to leave the country, but a complete eviction of the terrorists had been hampered as a result of the US and European countries' support for the group.